The O2Boot® and O2Sacral® FDA approved topical oxygen products are portable, one-time use for wounds and burns on arms, legs, and torso. Easy for patients or caregivers to apply and are secured to the body by a hypoallergenic adhesive seal. O2Boot® and O2Sacral® are indicated for use on skin ulcerations due to diabetes, venous insufficiency, post-surgical infections, gangrenous lesions, pressure ulcers, skin grafts, burns, frostbite, and amputations/infected stumps. Contraindicated for use on wounds completely covered in eschar, non-compliant patients, inadequate perfusion, and deep sinus tracts where wound cannot be probed. No smoking. Make sure no aerobic infections are present before beginning treatment. One size. 16 units per box. Therapy is performed over four consecutive days, 90 minutes per day, then three days off. Remove wound dressing, clean wound area of any ointment, then adhere O2Boot® or O2Sacral®. 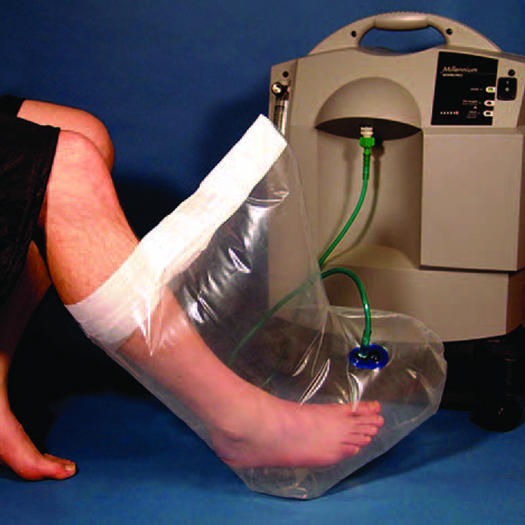 Connect tubing to O2Boot® or O2Sacral® to O2 Concentrator, adjust liter flow from concentrator, keeping O2Boot® or O2Sacral® inflated for 90 minute sesssion. Remove when finished and redress wound. All dressings and ointments must be removed so oxygen can reach a clean, unobstructed wound bed. All products are one-time use disposable and guaranteed defect-free or will be replaced. GWR Medical is the provider of FDA approved topical oxygen therapy (TO2) devices for the healing of chronic wounds. Therapy can be administered at home by patients or in any clinical setting, and products are all one time-use disposable.